What's the best way to tell if eggs are fresh when you don't have access to a glass of water (I.e at farmers market)? The teaching has been eggs from the farmers market are fresher than those at the store. I recently hard boiled eggs from both the farmers market and the store. The farmers market eggs had a big air pocket at the bottom ( conveniently making them easier to peel). I was always told that this is a sign they are not as fresh. I fed my baby the ones from the store instead. Above, there are three distinct "layers" to a fresh egg. As the egg ages, these distinctions fail in degrees every day. This is a fresh egg next to an older egg. A hard boiled fresh egg is very hard to peel when boiled; you wind up tearing chunks of egg white with the shell. We would wait about a week before trying to hard boil them. 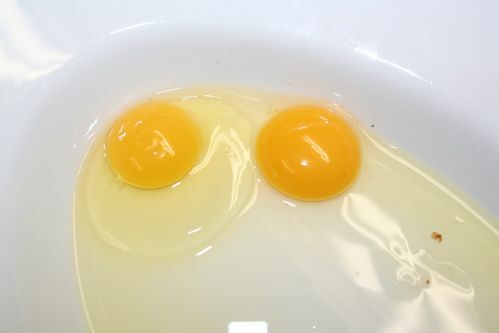 Individual eggs may have large air cells and still be fresh, but in general large air cells equate to old eggs, and possibly eggs that were stored at too high of temperatures. At higher temps, the air cell grows faster. 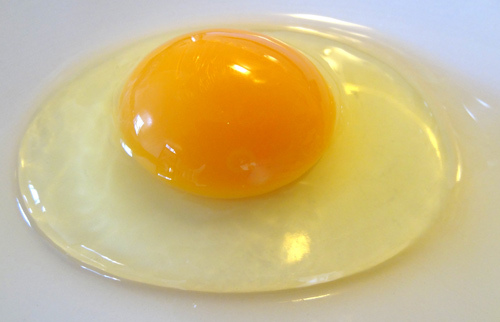 To test, use a small flashlight and shine it through the egg, and you can find the outline of the air cell. It is a bit more difficult with colored eggs, and you may have to use shadows to see the air cell in bright conditions. For the record, eggs are often stored incorrectly. Properly stored eggs should be placed with the air cell up, not down. The rounder side of the egg should have the air cell, the more pointed side should be placed down. The reason is, the air cell breaths through the porous shell as nature designed. Putting the air cell down, slows this breathing. Not only does this slow the growth of the air cell, sometimes making the egg look fresher than it really is, it also increases the chance of the egg trapping gases and going bad. Stored flat is also fine as again, the egg can breath, it is in cartons and such that orientation matters, and for some reason many believe the pointed side goes up and that seems to me the more common orientation when put in randomly. There's no foolproof to check the egg's freshness, even with a water bath. If you feel the eggs were not fresh enough, go back to the market and tell the egg seller that his eggs were not fresh. Ask him when the eggs were laid. If he's proud of his eggs, he will make certain that you get fresh ones. Which method of cooking does the age of the egg matter least? How can I ensure that scrambled eggs will be fully cooked? Why would you pinch egg whites when making sunny side up eggs? How do I make scrambled egg whites more like scrambled eggs?